Set comfortably in the northern area of the city and close to such sights as the Goethe and Muse sculpture, Spa Colonnade, and Caroline's Spring, the St Moritz Spa And Wellness Hotel Marianske Lazne is a good accommodation in Marianske Lazne for all kinds of travelers. It is surrounded by the lovely natural beauty which makes the entire region so incredibly popular, but it is also extremely convenient to the many spas, restaurants and shops of the downtown area too. 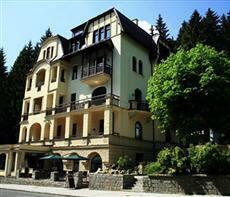 The St Moritz Spa And Wellness Hotel Marianske Lazne is located at Trebizskeho 599 and is approximately 20 miles from the Karlovy Vary International Airport. Guestrooms in the St Moritz Spa And Wellness Hotel Marianske Lazne are equipped with a full-sized work desk, high-speed Internet access, a personal safe, climate controls, satellite TV, a mini-fridge, direct dial phone service, and a private balcony. Those staying at the St Moritz Spa And Wellness Hotel Marianske Lazne will greatly appreciate the fine facilities and services, including the beauty salon, a currency exchange, pet friendly policies, private gardens, gift shop, room service, a concierge desk, 24-hour front desk service, a news stand, a tour desk, meeting and conference rooms, a modern fitness room, a swimming pool, golf course access, tennis courts, spa with massage and beauty treatments, free parking on the premises, an in-house restaurant, and more.